Individual molecules of a genetic material naturally repel each other, but if space is limited, DNA molecules must be packed together more tightly. This could occur in cell nuclei, heads of sperm cells, and the protein shells of viruses. At the moment, one of the top research topics is to discover a way to recreate significant biological processes in cells so as to better understand them. Recently, physicists from TU Munich and the Weizmann Institute in Rehovot have successfully recreated artificial DNA condensation on a biochip. This process can be recreated whenever DNA molecules are tightly packed into tiny spaces, such as circumstances that restrict the available volume. From a physical perspective, the phenomenon is interesting as it symbolizes a type of phase transition. DNA double helices, which in general repel each other because of their negative charges, are then packed together closely. In this condensed state they take on a nearly crystalline structure. The team headed by Simmel and his Israeli colleague Roy Bar-Ziv were able to bond DNA molecules, measuring just one thousandth of a millimeter long, tightly to nanostructures of different widths on a chip. The result looked as if tiny hairs were planted onto the chip surface by the researchers.The negative charge within the DNA molecules makes them repel each other, giving the appearance of minuscule nanohairs standing on end. The condensation process began when the researchers added an agent known as spermidine, which possesses molecules that have numerous positive charges. The formerly standing DNA threads collapsed one by one, dropping methodically onto the fine structures of the subsequent thread. 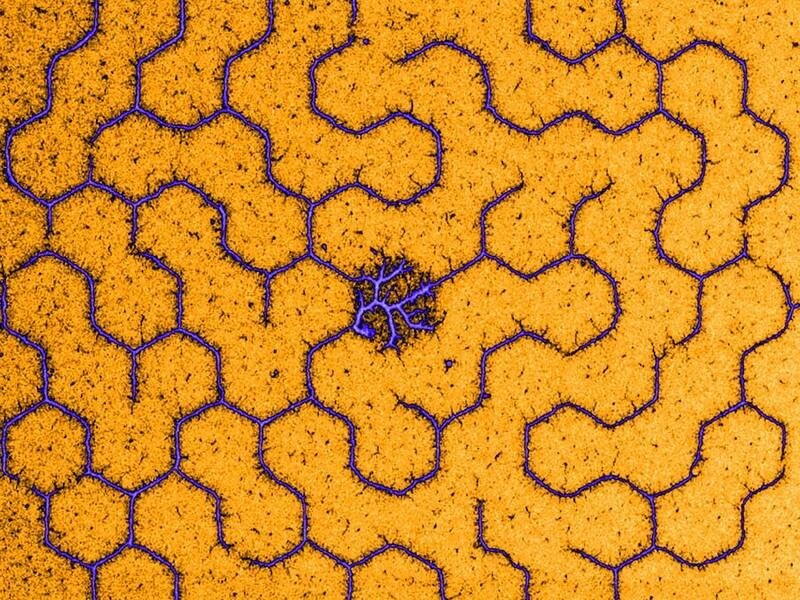 This is similar to dominoes falling at the nanoscale. The result was tightly packed layers of DNA molecules, just as they are in cell nuclei. All DNA molecules fell along the predetermined path. This is a very dramatic process. The DNA is instantly bundled in a single direction. Condensation and decondensation (the improved unpacking of DNA strands) have a vital role to play in processes such as gene expression. For instance, when the DNA molecules are tightly packed, it will be impossible to read the data coded in them. The researchers have an additional building block for developing artificial cells on the surface of chips and analyzing all related phenomena. "It is quite plausible to implement cell-like systems with densely packed DNA on a chip," says Simmel. Gene expression can be well-controlled using DNA condensation. DNA condensation will also allow genetic data to be copied in these kinds of artificial cells. In theory, it is also likely to use the tightly packed DNA molecules to transmit and distribute signals and data via a conducting path on biochips. Condensation and decondensation could be transformed to serve as on/off switches with proper temporal control. In addition to technical application probabilities, Friedrich Simmel is also keen on basic physics. We also want to understand the conditions of the phase transition during condensation. For this we have ideal conditions on the chip. We can precisely control where the condensation occurs and how long it takes. This is similar to supercooled water or beer in the freezer box, where the liquid rapidly freezes starting at a specific point with a crystallization seed and then disperses outwards from there. Here the only variation is that the concentration of positively charged molecules controls the phase transition rather than temperature. The Volkswagen Foundation, the German Research Foundation via the Excellence Cluster Nanosystems Initiative Munich (NIM), the Israel Science Foundation, and the Minerva 80 Foundation funded the research.